Family Guns is National Geographic Channel’s reality series about the family-run military antiques and collectibles business, International Military Antiques (IMA). IMA was founded in 1981 by Christian Cranmer, a British-born international authority on antique weapons. 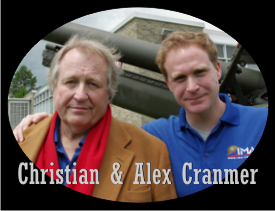 His American son, Alex, joined the business in 2004. Their corporate office is located in Gillette, New Jersey, USA. My family and I (the webmistress of this site) have thoroughly enjoyed watching Family Guns. We're history buffs and my husband has been a collector of antique, replica, and modern firearms and weapons for 40+ years. After watching Christian and Alex battle over collecting vs selling on the show, I now have a much greater appreciation and understanding for my hubby's penchant [obsession] for collecting so he probably has Christian Cranmer to thank for slightly less nagging from me about selling some of his collection. ☺ Thank goodness we don't have the funds, acreage, or zoning for a cannon or he would be ordering one of those from IMA! Are you a fan of Family Guns too? Then please read the rules and join the fanlisting. For more info on Family Guns, IMA, and the Cranmers, check out the links on the Extras page while you are here! What is a Fanlisting? In this case, it's simply a site for all fans of a particular television show to come together and build the biggest listing of people from all around the world who are fans of it. This site is a part of The Fanlistings Network, approved on 06-JAN-2013 to be the only fanlisting for Family Guns in their TV Shows category. Fanlisting © 2013+ Clair · Family Guns © 2012+ National Geographic Society. All rights reserved. · No infringements intended.